Depending on the animal and its temperament, it can be either a pleasure or a nuisance when it comes to taking a pet along for a ride. Unfortunately, there are certain hazards that come with having pets in a vehicle, and the wrong decision or action on the part of a pet owner can result in death or serious injuries to the animal. An animal who is allowed to ride in a car without any thought of safety is potentially at risk of falling or jumping from the vehicle, being thrown from it, disrupting the driver, and other hazardous incidents; because animals are entirely dependent on their owners to protect them from these threats, it is the responsibility of owners to ensure the safety of their pets. To do this they must understand what to do and what not do while driving with an animal in an automobile. There are many reasons why people take their pets with them when traveling by car, such as a trip to the vet, the beach, or a family vacation. As with any passenger, the driver must ensure that his or her pet is as comfortable and secure as possible. Unfortunately, this isn't always a possibility, as some animals become nervous and agitated in moving vehicles. It is important that people know their pets and whether they are able to travel safely in a car. If a person is uncertain, taking the animal for short drives around the block can reveal any nervousness or fear that it may have. This can help some animals adjust to being inside a moving vehicle and they may even begin to look forward to it. Some animals, however, may never become comfortable with cars, particularly if they have had a negative experience inside of one. If long road trips are unavoidable, a vet may be able to help by prescribing a sedative for the animal. Animals should never be allowed to wander or sit in the driver's lap while a vehicle is in motion. Like humans, they should be restrained for their safety and the safety of others. If one's pet is a feline, it should always travel inside of a hard or soft pet carrier. Dogs may also travel in an appropriately sized crate or carrier that allows them to stand, turn, and lie down comfortably. Whether the animal is a dog or a cat, carriers and crates must be secured, so that they do not slide and will not be easily be ejected from the vehicle in the event of an accident or hard stop. Harnesses or seat belts for dogs are another way to secure animals while driving. These typically attach to the car's seat belt buckle and are designed to keep animals from freely walking around in a vehicle, as well as potentially being ejected or thrown in an emergency. Dogs that are harnessed should never be allowed to ride with their heads outside of the car window. Although this may seem cute or fun, animals can easily be injured by flying debris. In addition to injuries to the eye or other areas of the face, they may also develop lung infections or sustain damage to their ears. Most people are aware of how important it is to never leave children alone inside of a parked car. This rule also applies to animals. In the summer, the inside of a car quickly heats to dangerous levels, even when the windows of the vehicle are open. Even when parked for a brief period a car can quickly become a hot furnace, causing heat stroke and the potential death of a pet. During the winter months, cars in extremely cold weather conditions can turn as cold as a freezer and also severely injure or even kill a pet. Seeing a domestic animal riding in the backseat of a car is not an uncommon sight. 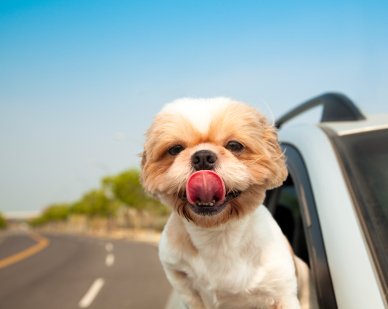 People drive with their pets for many reasons ranging from necessity to fun. Although many people travel with their pets in the car, they don't always take the necessary steps to ensure that they are safe. Learning how to drive safely with one's pet in the car is a positive step towards being a responsible pet owner. 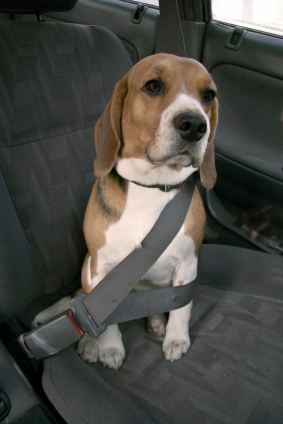 For more information on car ride safety for pets, please read and review the following links. Pet InsuranceKeep your vet costs down by obtaining the most cost effective insurance policy for your dog or cat. Travel Insurance CanadaAn easy way to connect with Canadian travel insurance providers is through Kanetix.ca. This one-stop shopping environment allows users to compare quotes from multiple carriers. Within minutes, you can choose the best rate for your travels. Travel Insurance for StudentsEducation can be expensive when considering the cost of books, room and board, and tuition. Add to these standard expenses a medical emergency without insurance and the costs can exceed your student loans. Travel insurance for international students can help to reduce those costs and keep the financial focus on school. Visitors To Canada Travel InsuranceVisitors to Canada are protected from expensive medical bills when they purchase emergency travel health insurance before the trip. A sudden illness or accident can quickly turn a dream vacation into a medical nightmare. Not only tourists, but people who are working here temporarily or migrating permanently should have this policy. Cheap Travel CoverageFortunately, you can find cheap travel insurance plans through the Kanetix.ca website. Affordable plans such as supplementary health insurance, all-inclusive and single-trip are available to protect you away from home. Be careful to read the fine print to make sure a cheap policy does not cost more for what is not covered. Money-Saving Travel Coverage TipsFew people are in a hurry to buy travel insurance. Most believe that the unexpected happens to other people - until they become the other people. While you are shopping for a good vacation deal, include a travel insurance policy in your plans. You can buy one policy that covers the entire family. Fully Inclusive Travel InsuranceWhen it comes to travel insurance, you have one of two options: buy multiple policies to cover different scenarios, or buy an all-inclusive policy to combine coverage. Generally, these policies come with exclusions and limitations. It is best to understand these exceptions before buying the policy. Canadian TravelSome people understand the wisdom in buying travel insurance for a trip to a foreign country. However, did you know that the same insurance is also available when travelling to a different territory or province within Canada? Most provinces will accept your province's health insurance. Additional coverage is needed where your insurance is not accepted. Travel Insurance AppThe KANETIX travel insurance app brings travel insurance coverage information to your smartphone within seconds. With this app, you can use our travel checklist and check weather forecasts. Entering Canada - Travel RequirementsDo you have what it takes into Canada? Find out what the travel requirements are for Americans and other non-Canadians entering Canada. Travel Insurance InfocentreFind out all you need to know about traveling to Canada. Get tips on buying the best travel insurance. You can also find out how to travel successfully as a foreign student to other countries. Use the infocentre to learn what you need to know for family and friends who are visiting Canada. Travel Insurance CoverageLooking for more information on travel insurance coverage? Read on to find out the four main categories of travel insurance coverage: medical needs, emergencies, baggage and trip cancellation. Top Up Travel CoverageBasically, top-up travel insurance is a medical emergency policy that travelers may purchase in addition to a regular travel insurance policy. This works best for someone who has a current travel insurance policy that does not provide enough coverage for the duration of a trip. Last Minute Travel TipsYou can get plenty of last minute travel deals on hotel rooms, flights and even travel insurance for a safe vacation. Most travel sites offer these items in a bundle package for a discounted price. Often, travel insurance is optional and you could pay a better price to buy it separate from the vacation package. Travel KitReceive a free travel kit from Kanetix before your next trip. The kit includes everything you will need such as travel insurance options, a packing checklist, emergency contact sheet and a travel itinerary. This is everything you will need to keep you organized as you prepare to travel outside the country. Vacation Interruption InsuranceYou pack your luggage and your trip is planned, and a natural disaster makes it impossible to fly out of the airport. With Kanetix, you can get trip cancellation insurance to insure your money paid on tickets and lodging. Compare quotes online at Kanetix to have peace of mind and know that you have a financial safety net from the unexpected. Travel Safety Tips For WomenFollow a few safety tips before, during and after your next solo vacation. Buy travel insurance to cover unexpected injuries or illnesses in a foreign land. Consider registering with a contact service in case you need an update on a natural disaster or family emergency. Bring your cell phone and program it with local emergency phone numbers.